Just try and do something nice! ALERT: This one is pretty geeky but, well, look who's writing it…. I spent a good part of my day off yesterday making what should have been a routine group of upgrades to the computer of She Who Must Be Obeyed. One of her Christmas gifts was an upgrade copy of Microsoft Office 2007 Professional –yes, that what She really wanted– but when the time came for Yours Truly to install the package we got an unpleasant surprise. Unbeknownst to us, the free space on her PC's original equipment 30-gigabyte hard drive had shrunk to only a few GBs and the upgrade would not install. So we purchased a nice new 80 GB drive for her. Yes, bigger drives are available for the same money, but it's my opinion that they are less reliable than the more modestly-sized units. Now, how to transfer the operating system and all those nice applications and files… Cloning was the answer and, after much research, I found an excellent home solution in Acronis Migrate Easy. I know, IT is my business and my fellow geeks might look down their noses at an easy, commercial solution. But IT is my business, not my hobby, and I didn't want the bother of the many other home-brew cloning processes and solutions; I just wanted to get the job done and on the first try. So I installed the new drive; purchased, downloaded, and installed the Acronis package; and ran it. It was easy as pie and maybe easier — crusts can be a pain. I was able to just click through the setup screens, tell it to start, and walk away. It didn't run as fast as I expected but, after four hours the process was complete. I removed the original drive and the PC booted up perfectly. I was delighted. So I went about installing the Christmas gift, installing Microsoft updates, and finally defragging the hard drive — there wasn't enough space on the old drive to do that before cloning. After those hours of work, all seemed well and I was ready to proclaim success to SWMBO until I rebooted and was presented with the dreaded Blue Screen of Death in the late afternoon. Too many changes, too many actions to know what happened to the poor Dell Dimension to make it so sick! BAD_POOL_HEADER …. STOP:0X00000019 the screen announced (in part). So I did some other diagnostic and utility stuff including scandisk, with the /f /r switches, but still was getting blue screens. Lots of thinking and searching indicated a leading cause was the Windows Indexing Service, or device drivers, or new software. I shut off indexing and still the computer crashed. Troubleshooting went on well into the night with a long break for Monk and Psych. This morning I continued my efforts first by disabling the Indexing Service, then restarting… a step I had not done the night before. Ah-ha! The system was stable. It ran until I tried starting the Carbonite online backup service which I had disabled for the cloning; I got an immediate Blue Screen! I uninstalled Carbonite (I hated doing that but it made sense. ), rebooted, and the system was stable again. Hmmmm…. finally we can get into some computer science experiments! So with the computer stable all morning I restored the Windows Indexing Service after lunch. 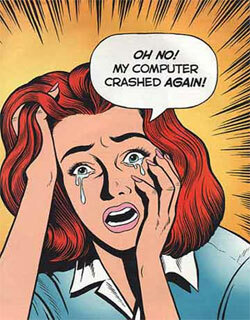 Soon the hard drive began to rattle as it had previously just before each crash. This time, however, the system stayed "up" and remained usable. My conclusion, after all this, is that the index file had been damaged during the transfer and my efforts (mostly leaving the Indexer disabled for some time) resulted in the Service rebuilding the corrupted file. I don't, by the way, blame Acronis which I still think is an excellent product –especially for home PC users who are migrating to a single new hard drive. Tomorrow or early next week I'll reinstall Carbonite and see what happens. I expect things will be just fine now, after all this stress and effort. That's how it goes, though… just try and do something nice! Oh, and it snowed about a foot over the past 24 hours. Isn't it frustrating that nothing ever turns out to be quite as easy as you think it is going to be. That's what you get for being a do-gooder geek!